In memory of the people who lost their lives during the terrorist attacks on 9/11, twelve years ago today, and in memory of the fallen heroes who sacrificed their lives to save others. 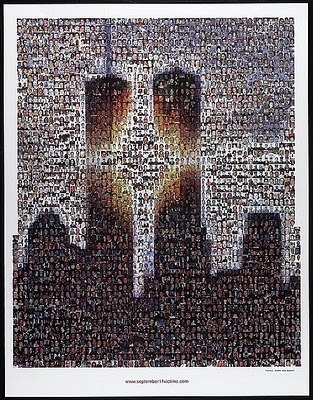 May their memories live forever! Darius, I lost friends in 9/11. Your comments about the motives of this blogger in posting a memoriam for 9/11 was tasteless and shameful. It was deleted as a sign of respect to the victims of the terrorist attacks in New York and Washington on that awful day twelve years ago. There was no disrespect to them but those riding on their waves. But as always, your site and your facts. I expected nothing less, since your disrespect and incognito remarks on my other opinions elsewhere bare witness. I am only here to remind you of the superficiality of your opinionated pseudo freedom gestures. Azari by Fortune, Iranian by Grace of God. Thank you for your response. Good to have you acting as an advisor on what is right or wrong to post! BTW, Let me assure you that I don't make any "incognito" remarks on anyone's comments, yours included. Former US congressman and presidential candidate Ron Paul has called the September 11, 2001 attacks the result of “decades of US intervention in the Middle East”. “We’re supposed to believe that the perpetrators of 9/11 hated us for our freedom and goodness,” Paul wrote on Facebook on Wednesday. “In fact, that crime was blowback for decades of US intervention in the Middle East. And the last thing we needed was the government’s response: more wars, a stepped-up police and surveillance state, and drones,” he wrote on the 12th anniversary of the attacks. Twenty one hours after the post went up, it had 35,000 “likes” on Paul’s Facebook page which has 1.1 million fans. A new poll conducted by "YouGov" showed that one out of every two Americans has “doubts about the official report of the 9/11 events." many innocent souls were wiped by the US as a result of that inhuman episode! @-but the whole thing is shroud in mysteries and ambiguities which the rational mind can not comprehend!. @-and why is the US courting AND USING AL Qaeda in Syria in broad daylight ! ? Good point, B.M.A. The US using al qaeda to fight on their behalf in Syria is a slap in the to the 9/11 victims and their families. To think that certain people commenting and posting on this site actually support that! What a sick world.